Our first social event, organised and hosted by the teams of Killeen Lodge and Clarey Lodge on 19th March 2015, featured various amusing activities for our resident attendees and staff. 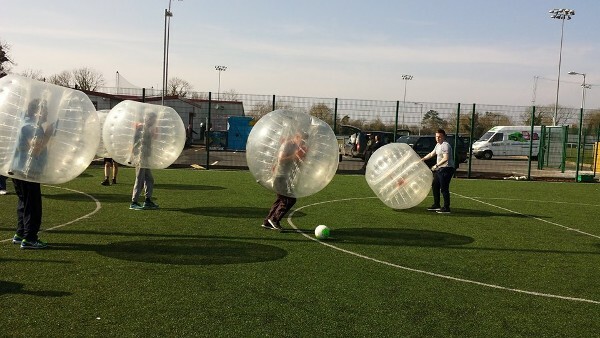 With a pitch shared by residents and their staff, a mix of teams took part in fun game of Bubble Soccer. Afterwards, some took an optional cool-off dip in the Water Dunk Tank! Once dried off and having generated a great hunger on the pitch, guests were treated to a delicious barbeque, fresh salads and minerals while enjoying all of their favourite songs courtesy of a DJ. On 24th April 2015, the staff team of Fairgreen Day Service and Kilbride House organised and coordinated a charity event with all proceeds going to the Irish Cancer Society’s ‘Shave or Dye’ 2015. Nua residents and staff participated in some light-hearted fun such as; Sumo wrestling, a mechanical bull competition and a friendly game of Football. Kindly, several residents volunteered for their hair to be dyed or shaved completely! Well done to everyone involved in the organisation of a great fundraising day and especially to all those who helped raise money in aid of the Irish Cancer Society. On the day, they managed to raise €447. Thank you to you all! Last but not least, Rathbeag’s residents and staff organised their fun day, making the most of our recent beautiful but rare sunshine. There were lots of exciting activities for residents to enjoy at Rathbeag’s facility such as; giant-sized versions of the games, Jenga and Connect 4 and an inflatable obstacle course which we heard generated a great deal of laughter amongst staff and residents alike. Once all the activities concluded, it was time for another tasty barbeque. Thanks to the team in Rathbeag for hosting a great day!